Value Added Tax (VAT) is a charge based on a fixed percentage of the selling price of goods and services. Companies that are registered for this tax must charge it to their customers whenever they make a sale; however, they are allowed to claim back the VAT they pay to their suppliers. Although VAT may be chargeable at several points in a manufacturing chain, it can usually be reclaimed at every stage apart from the last. Consider a company that makes sells deckchairs directly to consumers. When consumers buy a deckchair, they are actually making two payments in one (although they may not be aware of this): they are paying the retailer for the chair, and they are paying revenue to the Government in the form of VAT (which the retailer collects, aggregates and then sends on to HM Revenue & Customs). The retailer must also pay the levy on the cost of the chair from the manufacturer, but they can claim this back. Similarly, the manufacturer must pay the duty on the raw products used to make the chair, but again can claim this back. In this way, VAT is charged but reclaimed all the way up the chain. In this way, it emerges as a final tax on consumers without being a burden on the finances of businesses (and the length of the production chain is irrelevant to how much irreclaimable tax is paid). At each stage in the manufacturing process, a business takes their raw materials, adds some value (for example by combining raw materials into a product, or by placing a product in front of consumers) and passes the materials on. 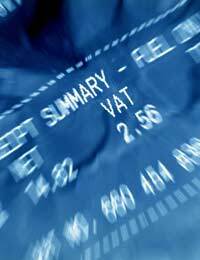 VAT gets its name because it is charged on the value that is added at each stage. Some items – such as certain services in finance and education, and services involving selling or leasing commercial land and buildings – fall completely outside the scope of the VAT system. Consult the professional who prepares your accounts, who will be able to advise you whether this applies to your business. Although the EU has harmonised the rules and regulations for VAT, member states can choose what rate they wish to apply. International transactions may be subject to duties. The rules regarding exactly what is payable and to whom depend on whether the other country is within the EU and on the value of the transaction. You should seek professional advice regarding this if you trade goods or services with other countries. You must register for the scheme if your turnover for the previous twelve months is above a set limit. At the time of writing, this limit was £67,000. If you sell only zero-rated goods and services, you may apply for exemption regardless of your turnover. If you sell only VAT-exempt goods or services, you cannot register for VAT, so neither can you claim it back on things you buy. You may choose to register voluntarily even if your turnover is below this limit. A good reason to do this would be if all your products were zero-rated (so there was no charge to pass on to your customers), and the amount you could claim back on your purchases accounts for more than the extra administrative cost of being registered. I have a limited company but don't sell any goods, i provide a service building train interiors working through agency's. would i benefit from going vat registered? I work away and pay hotel bills, food and travel. this is put through the business as expenses. how would vat work in this situation and how would i clam?